Thank you to everyone that joined us for the introduction to World Innovations Forum. Find the event report and pictures here. The World Innovations Forum 2018 will bring together all Innovation Stakeholders from 50 countries. Including Entrepreneurs, Investors, Enablers and Government Representatives for innovation and economic development. WIForum empowers all attendees to inspire, influence and induce others to engage in necessary actions and strengthen sustainable innovation and entrepreneurship. 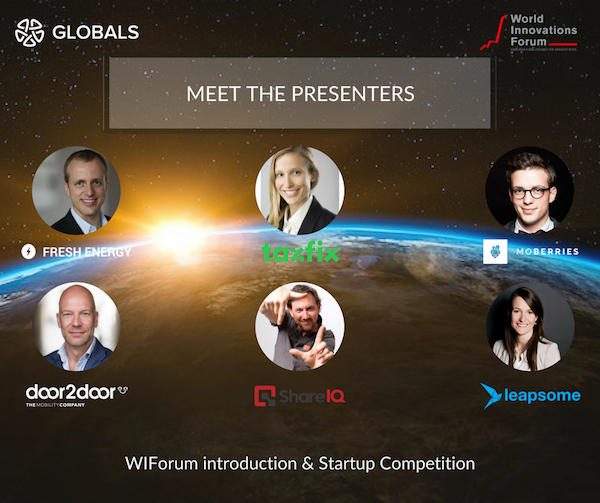 GLOBALS founder Mario Paladini is the German ambassador for the World Innovations Forum and on The 6th of December we will meet the best startup/scaleup that will compete for the title Best German Startup and later on at The World Innovations Forum for the title Best Startup in The World. The winners will be guided to make business in the 50 countries that WIForum is working with. This first truly global startup/scaleup competition is part of the World Innovations Forum, nominating the best entrepreneurs in each country and the best in the world. We will explore ALL registrations and select the 4-6 most compelling applicants. Developing a mindset to think bigger, move faster and conquer any size market. How you and your team can do local what was thought is only possible in Silicon Valley. The best German Startups compete for the title Best German Startup and later on best startup in the world. 4-6 teams will be pitching in front of the jury and audience. Welcome Drink, nice music, great views of city west and get together.